1/10/82 - Stockholm, Concert House. Article here. 7/10/82 - Stadsgehoorzaal Leiden - Photos here Review here Bootleg CD "Leidenese Boy"
8/10/82 - Brussels Flemish University. Bootleg exists, including soundcheck..
22/10/82 - Brighton Dome. Review here. 22/10/82 - BBC TV "Old Grey Whistle Test" - "Nightporter" & "The Art Of Parties". 30 ~ 31/10/82 - Sheffield City Hall (2 nights). Review here. 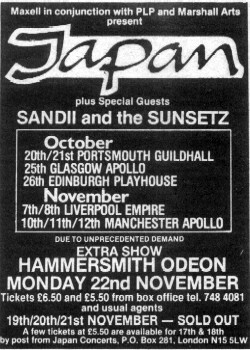 7 ~ 8/11/82 - Liverpool Empire (2 nights) - at one of these shows there was a technical problem during "Sons Of Pioneers" so the show was re-started. 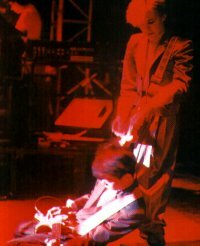 8/12/82 - Tokyo Budokan (with YMO members). Broadcast on FM. Bootleg exists: "Visions Of China" 3-LP. View photos here. 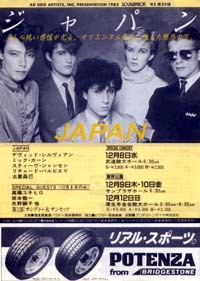 9~10/12/82 - Tokyo Nakano Sun Plaza. Japanese bootleg CD exists from one show. 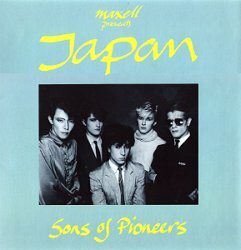 Masami Tsuchiya played on this tour and the support band was Sandii & The Sunsetz, who made the occasional guest appearance during Japan's set for Life In Tokyo and Fall In Love With Me. Set list: Burning Bridges, Sons Of Pioneers, Alien, Gentlemen Take Polaroids, Swing, Cantonese Boy, Visions Of China, Nightporter, Canton, Ghosts, Still Life In Mobile Homes, Methods Of Dance, Quiet Life, European Son (new arrangement), The Art Of Parties, Life In Tokyo (new arrangement, with a long ambient guitar intro from Masami), Fall In Love With Me. 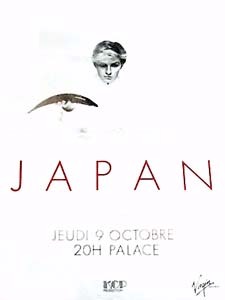 During the Budokan show, Bamboo Music, Taking Islands In Africa and Akiko Yano's song Goodnight were also performed, with Sakamoto, Takahashi and Akiko onstage. Thanks to Masamichi, Henk and Craig for updated information on this tour. This YouTube clip is of Masami performing "September Love" but includes backstage and audience footage shot during the tour. Enjoy!